The Dane County Law Library hosts the Dane County Bar Association as they celebrate ABA's National Pro Bono Week. In the spirit of the week, free legal information will be provided by volunteers from the Dane County Bar Association. On Tuesday, stop by the library to ask volunteer attorneys your general legal questions at this special drop-in event. Volunteers are available from 8 to noon. Also on Tuesday the regularly scheduled Small Claims Assistance Center will be open extended hours, from 8 a.m. to 12 p.m. to assist small claims litigants with forms and procedural information. On Wednesday, the regularly scheduled Family Law Assistance Center will be open extended hours from 10:30 a.m. to 2:30 p.m. with a Spanish-speaking volunteer available from 11:30 a.m. to 1:30 p.m. Regularly scheduled clinic information is on the Dane County Court website. Help Dane County celebrate! Attend the free ABA Pro Bono Week/Free Legal Information Clinics or volunteer your time. Tuesday 27th 8 a.m. - 12 p.m.
Wednesday 28th 10:30 a.m. - 2:30 p.m. The last week of October is National Pro Bono Week. This week shines a spotlight on pro bono work with special events for volunteer attorneys and the population they serve. Wisconsin is fortunate to have many free or low cost legal assistance organizations. We list several of these by county on our website. If you are an individual looking for help, check our directory for an organization near you and ask local organizations if there are any special legal clinics this week. Our county directory might also be useful for attorneys looking for opportunities to volunteer. Also, follow the Wisconsin Access to Justice Commission online; the Commission was created to support civil legal services for low income Wisconsin residents. This is the week to volunteer - or recognize those who are already volunteering. Learn how to nominate yourself or someone else for the Pro Bono Honor Society. Federal Habeas Corpus Practice and Procedure helps attorneys navigate post conviction procedure. Organized according to the steps that a petitioner typically would take in a habeas corpus case, the book is easy to follow. It begins with post-conviction remedies and subject-matter jurisdiction, and then continues with the filing of the petition, pre-filing and post-filing stays, various pleadings that may be filed, proceedings that may be held, procedural defenses, post-judgment proceedings, and appeals. 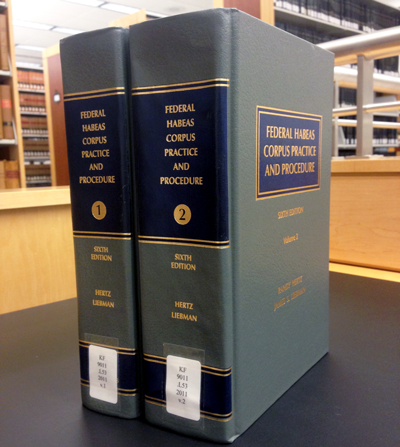 Written from the "procedural perspective" of prisoners and detainees, it discusses complications that may arise for the applicant of federal habeas corpus. The book is well indexed allowing readers to jump to specific sections and find the answer to a particular issue quickly. Now in its 6th edition, the treatise and accompanying annual supplement provide analysis of the latest habeas corpus statutory and case law. Extensive footnotes appear throughout and tables of cases and authorities are included. Appendices point to relevant statutes, rules, and legislative materials. Federal Habeas Corpus Practice and Procedure is available to check out at the State Law Library. Now is the time to polish your WestlawNext skills! Learn more about our classes and register online. Tuesday, October 20, Noon - 1 p.m.
Tuesday, November 17, Noon - 1 p.m.
Don't miss our Milwaukee class on Searching Google Scholar and Google Books for research, offered November 11 at the Milwaukee Public Library. Our October newsletter features two big research announcements. ABA Journals are now available full text on HeinOnline. The library is also moving away from Westlaw.com (or Westlaw Classic) in favor of exclusively providing WestlawNext to our library users. Bev Butula presents People Search at the Milwaukee Public Library. New WestlawNext classes are open for registration through the winter - and just in time for our transition away from Westlaw Classic here in the library. Sign up for any of our free CLE classes, offered monthly. Learn how to best use WestlawNext in this course by: Finding Specific Cases, Statutes and Regulations by citation; Learning how to quickly find and search specific resource; Learning about plain language searching on WestlawNext; Utilizing result list filtering to narrow your search results; Exploring document features, including new "Copy with Reference"; Learning about new WestlawNext history; Reviewing the basics of the WestlawNext Citator - KeyCite. Tuesday, December 15, Noon - 1 p.m. Learn how to best utilize WestlawNext in this course by Discovering the power behind WestSearch plain language searching; Utilizing "Find a case by party name" feature; Learning about result list sorting and advanced filtering techniques, such as "search within results"; Exploring headnotes and other editorial enhancements, such as notes of decisions and statutes index; Covering advanced options for filtering Citing References; Learning about content category pages in the "Browse" menu. Tuesday, January 19, Noon - 1 p.m. Learn how to best utilize WestlawNext in this course by: Learning about advanced search and field searching on content category search pages; Harnessing the power of advanced annotation features such as highlighting and foldering; Incorporating Key Numbers and Key Number Searching into your research; Exploring headnotes and other editorial enhancements, such as notes of decisions and statutes index; Covering advanced options for Alerts and Automated searches; Utilizing advanced customization features for "Copy with Reference", Highlighted terms, Result list display, and Document Delivery; Learn how to access WestlawNext from other devices.